A new report published by Persistence Market Research titled “Breast Implants Market: Asian Industry Analysis and Forecast, 2017–2025” states that manufacturers are focusing on developing innovative products to retain their market share. The analysts have observed that manufacturers are using highly cohesive silicone material to enhance the overall appearance of implants to gain market share. Manufacturers are meeting the needs of patients by supplying the best breast implants to end users. Key market players are focused on developing high-quality breast implants with premium pricing. It has been observed that companies are entering into mergers and acquisitions to expand their product portfolio and market presence in Asia. The breast implants market in Vietnam is expected to record comparatively less growth due to low awareness about breast implants among key stakeholders such as patients and healthcare professionals. China represents the most lucrative market followed by Rest of Asia, Thailand and Malaysia. This report covers the Asian breast implants market performance in terms of revenue contribution from various market segments. This report includes Persistence Market Research’s analysis of key trends, drivers, restraints and opportunities, which are influencing the growth of the Asian breast implants market. Impact analysis of key growth drivers and restraints are included in this report to better equip clients with crystal clear decision-making insights. The Asian breast implants market report starts with an overview of the breast implants market and highlights the factors driving the female population worldwide as well as in Asian countries to seek breast augmentation procedure. This section of the report also underlines factors influencing the growth of the Asian breast implants market along with a detailing of the key trends, drivers, restraints, opportunities and regulations. Impact analysis of key growth drivers and restraints based on the weighted average model along with key country-specific trends is included in the report to provide information and hidden insights. At the end of the report, Persistence Market Research has provided key strategic recommendations for both existing and new players in the market to emerge sustainably profitable and strengthen their footprint in the Asian breast implants market by differentiating themselves. This section also has detailed company profiles including company-specific long-term and short-term strategies, key offerings and recent developments in the Asian breast implants market. Persistence Market Research leverages secondary research extensively to ascertain the overall size of the Asian breast implants market and top industry players. In addition, the experienced team of analysts has gathered relevant market insights and data by speaking to the various manufacturers and other key stakeholders based in various countries. The analysts have then sliced and diced this massive amount of data gathered through primary and secondary research and validated it using different methods such as the triangulation method and have finally scrutinized the data using advanced tools to glean pertinent qualitative and quantitative insights into the Asian breast implants market. Yearly change in inflation rate has not been factored in while forecasting market numbers. Indicators such as R&D expenditure, research funding from government and non-profit organizations etc. have been considered to arrive at the indicated market numbers. Bottom-up approach has been used to evaluate market numbers for each product category, while top-down approach has been used to counter-validate the reached numbers. Historical consumption trend has been analyzed to track data. Another notable feature of this report is an analysis of the revenue forecast of the Asian breast implants market in terms of absolute dollar opportunity, critical in assessing the level of opportunity that market providers can look to achieve and also to identify potential resources in the Asian breast implants market. Also, to dissect the different market segments in terms of their growth and performance in the Asian breast implants market, Persistence Market Research analysts have developed a market attractiveness index to help market players identify current and future market opportunities. 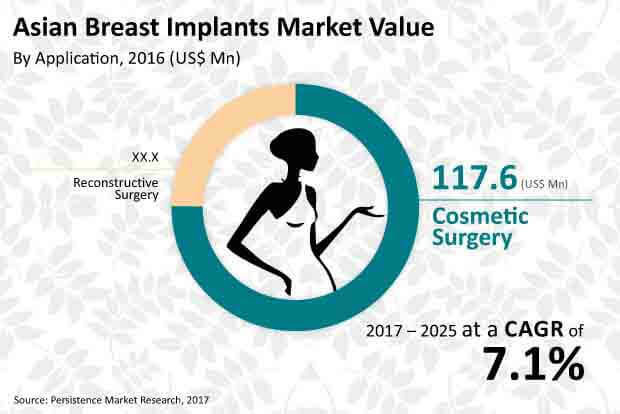 Cosmetic surgery segment is expected to account for more than 75% revenue share of the Asian breast implants market by 2017 end and is expected to gain more than 150 BPS in its market share over the forecast period. The cosmetic surgery segment is slated to register a CAGR of 7.4% while the reconstructive surgery segment is expected to grow at a CAGR of 6.3% over the projected period. The reconstructive surgery segment is estimated to lose more than 150 BPS in its market share over the forecast period and reach a market valuation of more than US$ 60 Mn by 2025. The cosmetic surgery segment is expected to dominate the Asian breast implants market in revenue terms in 2017 and this trend is projected to continue to do so throughout the forecast period. Cosmetic surgery is the most attractive application segment, recording a market attractiveness index of 1.6 over the forecast period. The reconstructive surgery segment is likely to be the second most lucrative segment in the Asian breast implants market, with a market attractiveness index of 0.4 during the forecast period. Reconstructive breast surgery is usually performed in order to treat structures of the body affected functionally. Breast reconstruction after mastectomy is generally covered under Medicare resulting in the rise in a number of breast reconstruction procedures worldwide. The rise in annual disposable income per capita of women in Asian countries is creating a positive impact on the cosmetic surgery segment of the Asian breast implants market. Socio-economic status is a prime factor creating higher demand for breast implants in Asian women. The primary customer base for breast implant procedures are women belonging to middle and high-income families. Additionally, a significant rise in the world’s middle-class population over the next few years, resulting in an increase in purchasing power and discretionary spending are indicative of the stability and growth of the cosmetic surgery segment worldwide. Breast cancer is a leading cause of mortality worldwide particularly in less developed countries, mainly attributed to shifting lifestyles and unavailability of adequate healthcare infrastructure coupled with less penetration of clinical advancements to combat the disease. Rising prevalence of breast cancer is a major factor contributing to the revenue growth of the cosmetic and reconstructive surgery segments across the globe. A large number of women are conscious about the physical appearance of their breasts leading to increasing number of breast augmentation procedures in developed countries such as China and Indonesia. However, some of the most common reasons for breast augmentation procedures include changing the breast size, restoring the natural appearance of the breasts, and correcting capsular contracture. This factor is likely to create robust development in the cosmetic surgery segment over the projected period. Growing focus on aesthetic appearance driven by popular media influences such as television shows and various consumer awareness programs is expected to drive the market for the cosmetic surgery application segment in China; while in Malaysia, fat transfer breast augmentation procedure is anticipated to fuel the cosmetic surgery application segment in the coming years. In Indonesia, the reconstructive surgery segment is expected to reach more than US$ 3 Mn in 2017. Cheaper cost of breast implant surgery in Thailand is predicted to boost the revenue growth of the cosmetic surgery segment over the forecast period.